Marvel fans who were in attendance at San Diego Comic-Con were given one heck of a show. Marvel Studios brought their A-list material from top to bottom, showcasing Ant-Man and the wasp, Thor: Ragnarok and Black Panther. But the main event was them showing the allegedly incredible Avengers: Infinity War footage that first screened at D23. To the dismay of a great many fans around the world, Marvel decided not to release the footage online yet. Thousands of fans were packed into Hall H at SDCC this year to watch the Avengers: Infinity War footage, but that is a drop in the bucket when it comes to Marvel's entire fanbase. So the fact that they haven't released this footage after screening it at two exclusive events that most people don't have the chance to go to has caused quite the stir online. People are getting impatient. It is even causing some Marvel fans to say some things they probably don't mean. Like Twitter user Kris Mauna, for example. "Ugh, I hate everyone who's seen the Infinity War footage." Come on now, Kris. Do you really hate Robert Downey Jr.? Probably not. But we get her point. It is understandable that Marvel Studios wanted the Avengers: Infinity War trailer to be exclusive for D23, but it is equally understandable that fans would have expected them to put it online following the San Diego Comic-Con presentation. Though, they did release a new Thor: Ragnarok trailer (and it's awesome) which is currently pinned to the Marvel Entertainment Twitter account. That seems to be what they want fans focusing on. In case you missed it, here is one of best descriptions of the Infinity War footage from Screen Rant, since you can't see it for yourself yet. "The trailer begins with a passed out and wounded Thor floating in space. Guardians of the Galaxy hit him as they are flying through space in the Milano. He's stuck to the windshield and Rocket proposes using the windshield wipers to wake him up. Thor is brought into the Milano, wakes up, and says, "Who the hell are you guys?" There's a cut to Loki holding the Tesseract. Shot of Spider-Man on a bus, arm hair stands up, confirming Spidey sense. Iron Man working with the Guardians. Thanos arrives to battle Avengers. Spider-Man shown wearing new suit from end of Spider-Man: Homecoming. Cut to Peter with mask off saying, "I'm sorry," to Stark. Thanos battling Doctor Strange, Star-Lord, and Iron Man. Shows Captain America in new (Nomad?) suit with a beard. Black Widow is now blonde. 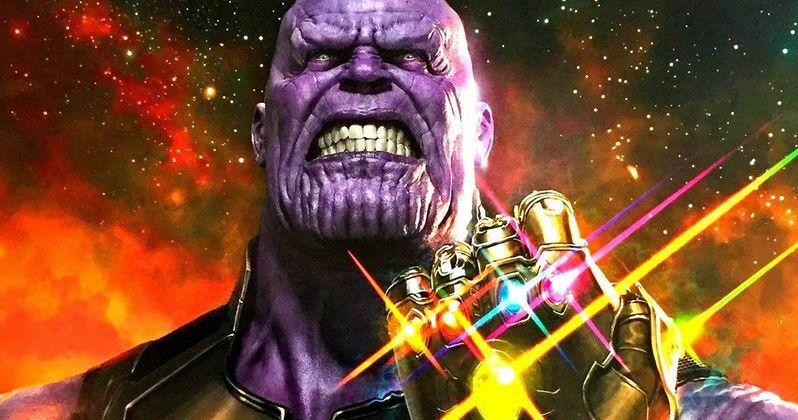 Thanos pulls pieces of the moon to Earth to toss at Avengers. Logo." For now, all of the Marvel fans who couldn't make it to D23 or San Diego Comic-Con are just going to have to be patient. Some partial footage leaks have made their way online, but they are of poor quality. Is that really how you want your first taste of Avengers: Infinity War footage? Probably not. For now, you can check out some fan reactions for yourself below so you know you're not alone. Ugh, I hate everyone who's seen the Infinity War footage. I just want the infinity war trailer.. that to much to ask for @MarvelStudios ?